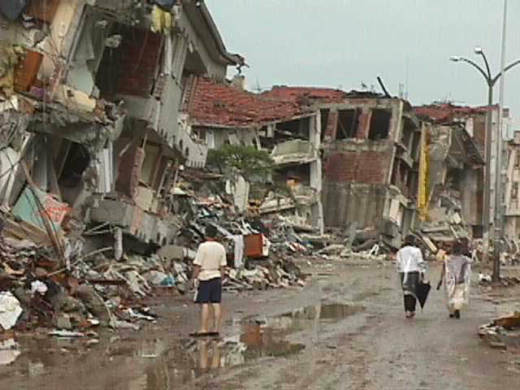 In particular, some scientists thought tremors that preceded a 1999 earthquake near Izmit, Turkey might prove that foreshocks are warnings of bigger quakes to come, due to the way geologic events played out miles below the surface. But new and expanded analysis of seismographic data from that magnitude 7.6 event shows no connection. "We found that the foreshocks — the earthquakes that preceded it — were no different than ordinary earthquakes," says geophysicist Bill Ellsworth, who led the study for Stanford. "There were no characteristics that impending signs of an earthquake about to happen." "This has been the quandary for some time," says Brodsky. "This study reinforces that quandary by once again finding no specific attribute of the foreshocks that can distinguish them in real time." This kind of quake prediction is distinct from current efforts to provide "early warning" of impending quakes. The latter is based on technology picking up the "P-wave," or primary wave that precedes the shaking and instantaneously transmitting a warning seconds before that shaking arrives at your location. "For us to 'predict' something will follow, we need to see a sequence of events like this before all earthquakes. We do not," adds Richard Allen, who heads the Berkeley Seismology Lab at UC Berkeley." "What that leaves is a very interesting scientific question about the process by which an earthquake starts," offers Richard Allen, who heads the Berkeley Seismology Lab at UC Berkeley. "Does it start with slow slip that grows and may generate foreshocks? 'No it does not,' says this study." Ellsworth says studying faultlines has given us much better knowledge of where quakes are likely to occur and even how strong they might be — but this latest study leaves doubt that foreshocks can tell us when. "We know that small earthquakes are symptoms of conditions that are favorable for occurrence of larger earthquakes," he says. "We just don’t know when those small earthquakes say the larger one will occur." Therefore he says, the key is for communities to be truly prepared for the big event, whenever it happens. The joint study by scientists at Stanford and in Turkey at Boğaziçi University’s Kandilli Observatory and Earthquake Research Institute was published online Monday in the journal Nature Geoscience.